Sorry about the long hiatus, gang! Elf is back to keep up with the site, and there are going to be some changes with the design as soon as I get a chance. If you find us and like us, help spread the word! Things like this only get started with your help, loyal followers. 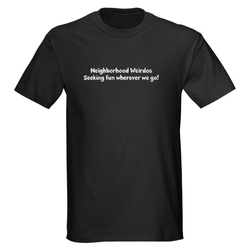 There are several members that don't visit the site, so keep an eye out for anyone proclaiming themselves as "Neighborhood Weirdos". Have fun! Just click on the picture of the T-shirt to the side! Who are the Neighborhood Weirdos? The Neighborhood Wierdos are a non-profit organization intended to provide fun for both the weirdos and their neighbors. Have you ever wished that you could have a good reason to run down the street dressed as Darth Vader in a toga? Well now you do! Our exploits, though not exactly normal, are designed to provide maximum entertainment for all those who participate! So you want to join the Neighborhood Weirdos? Well you've come to the right place for it! There are no requirements, except for being willing to do what you want and push aside all fear of judgement. Remember, it's all for fun! If you wish to sign up go the the "Join Now!" page and we'll talk you through it from there. The Neighborhood Weirdos were founded by Cat, Elf, and Flower. (Those are not our real names!) We are here to help provide entertainment in your life and fight off the forces of boredom. If you want to be a part of this, sign up! We'll be glad to have you!